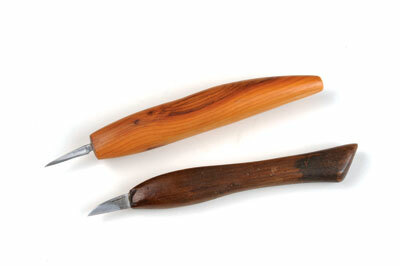 Knife carving is a fun and inexpensive way of starting out carving. You don't need a lot of tools and equipment to start; you don't need loads of large sections of wood and you do not have to have a fully built workshop to enjoy this aspect of carving. As with many hobbies and crafts, there are lots of knives to choose from and this can be a little bewildering to start with. But don't worry, here are a few pointers on knife choice, safety and technique to help you get going with knife carving and to start having fun with this fascinating carving technique. 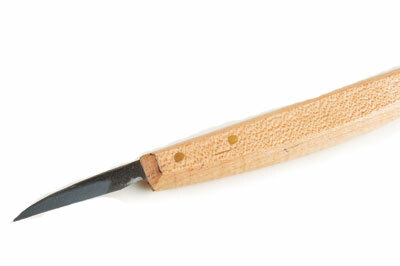 There are three main types of knife and all of them have very different requirements when it comes to sharpening. The normal carving or paring knife is designed to cut through wood, coming out at the other side, so it needs a long flat bevel. This bevel can be achieved by rubbing carefully on a flat oil or water stone or diamond pad until a small, regular burr is formed at the cutting edge. 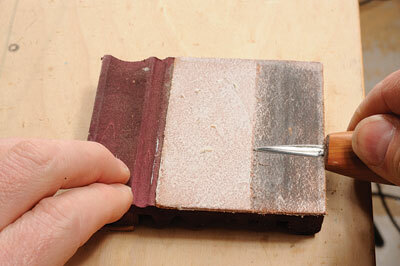 This is then removed by honing, keeping the blade absolutely flat on the strop at all times. The detail knife used for cutting into the surface of the wood needs a slight curve to the bevel which acts as a depth stop. This is achieved as above but the back of the knife blade is held away from the surface of the stone, in effect producing a second bevel. When the knife is subsequently honed, also with the back edge of the blade slightly lifted, a curved bevel results. The chip carving knife - a mixture of the two - is also designed to cut into the surface and has a steeper flat bevel to aid the 'stabbing' action necessary with chip carving. This can have a curved bevel or may, in some cases have a more defined second bevel. Whatever the bevel detail it is important that it is absolutely flat for a distance from the cutting edge or it will skid off the surface of the wood. This could extend for anything up to 3mm from the cutting edge. There are, of course, many other specialist knives designed for carving spoons, sticks and bowls and all of these have their own requirements but will, in general, fit in with those mentioned above. 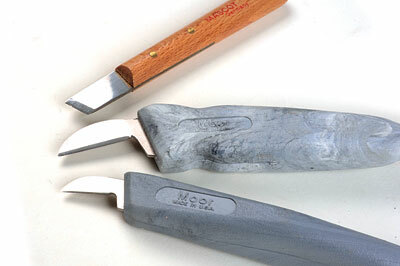 I am not in favour of being too dogmatic about the final details of the edges on carving tools - knives or gouges - as we all work differently and want a variety of results from our efforts. What is most important is that any tool does what you want from it. This may mean a long or short, steep or shallow bevel. Once you have got what you want, stick with it. Make sure you choose a good quality, well-made knife and remember that cost is not always an indication of quality. One of the best knives I have used is the cheapest available from the USA. I have tried most knives on the market and have come to the conclusion that, while the best gouges come from Europe, some of the best carving knives are made in the USA. As most knives come with quite slim handles that can cause discomfort in the elbow with prolonged use, you might like to purchase the blade on its own and make your own handle to a size and shape that suits you. You will need to be a little selective, as they will not all suit the needs of British carvers. Our woods are generally harder than those used in the US and a knife that is too hard can be too brittle, thus losing its edge or breaking. 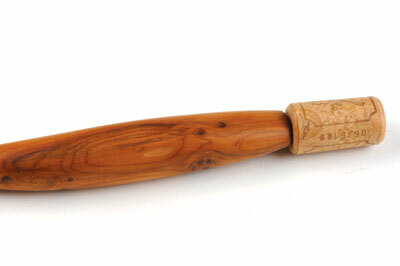 I know of manufacturers that will make a knife with a slightly softer blade for use with these harder woods. You might like to ask if this is possible. 2. Use a scalpel - with safety glasses as you will invariably break a number of blades. This will also make sure you only take off small pieces which will avoid any strain to your hand and wrist. It is important to wear suitable protective gloves, preferably on both hands. 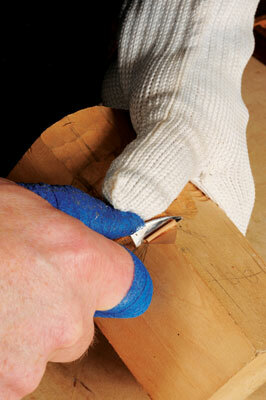 There are many such gloves available today that are comfortable to wear and don't hinder the carving process. Many carvers ignore protecting the knife hand but it is easy to collect a large number of small painful cuts from the bottom of the blade while carving. An alternative to another glove is to use a non-sticky bandage. This can be wrapped around the thumb and first finger and gives good protection. It can be purchased from chemists as well as equestrian suppliers, which are much cheaper. It is generally called Vetwrap - though the Australians call it Wimpwrap! Most bad cuts are caused by the knife 'going wild' once it has come out of the wood. This can be avoided by keeping the knife hand in contact with the chest or stomach while carving and moving the wood, held in the other hand, towards the body, in effect, ensuring that all cuts are made away from the body. This is made more effective if the thumb of the hand holding the wood is kept in contact with the knife or is pressing against the thumb of the other hand. This may feel awkward to start with but is a very quick and effective way of removing wood and, more importantly, is very safe. You don't have to fight to get the knife back under control. The best way to protect the blade of your knife - and to stop it cutting you when in your toolbox - is to get some clear plastic tubing long enough to cover the blade and fit it over the end of the handle. By warming this in hot water you can stretch it to the shape of the end of the handle and it will stay in place. Some people use wine corks but, unless you use the synthetic variety they will cause the blade to rust. If you do use a cork make sure you place it on the bench when you insert the blade - do not hold it in your hand as the blade can very easily come out of the side causing horrendous cuts. I have seen this happen more than once! Whichever knife you are using it is imperative to keep it sharp. There are many ways to do this and you will need to choose a method that suits you. Generally, regular stropping with a leather or canvas strop, dressed with chrome cleaner or other suitable polishing compound, is enough, but you may find that you need to flatten the bevel occasionally with an oil or diamond stone. I do not recommend using power for stropping unless you have a very slow moving wheel and, even then, great care is necessary. There have been some very nasty accidents with the back of knife blades catching on a fast moving wheel - be warned! The secret of successful carving is to never let your tools get blunt. Honing regularly - around every half an hour or so - will keep an edge very sharp thereby making the carving process much easier. The longer you work with a tool before honing it, the harder the sharpening process will be and your carving will be harder too.